Soda blasting is a gentle alternative to media blasting. It uses regular baking soda and a vacuum syphon gun made from an air blaster and flexible tubing. 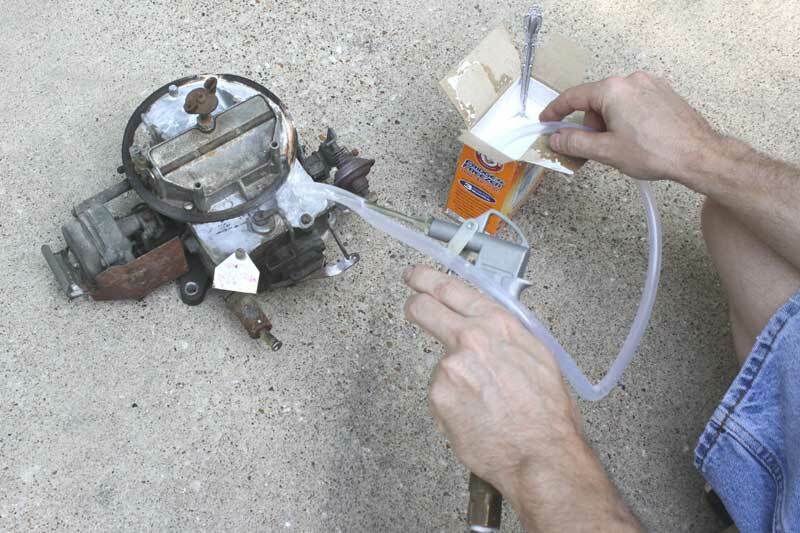 Soda is very gentle on delicate surfaces like aluminum, so it's perfect for carburetors. Soda is also very cheap and available. This setup does not capture or recycle the soda. When you blast with ANY media, don't breathe the fumes. Don't rely on those little paper masks either, they do nothing. Use a decent respirator with filters. They're about $30 at Home Depot. You'll look like a dork, but your airway and brain cells will thank you! If you value your eyes as much as your airway and brain cells, use eye protection too. Media from blasting can bounce off parts and shoot back in your face. Cut the tubing to 24". Drill a 3/16 diameter hole in the side of the tube, 2" from one end. Don't let the bit go through both sides. Clean up the frazzled edges with an exacto knife. These dimensions work for the air gun I bought which has a 3/16 diameter nozzle. Insert the nozzle into the hole about 1". It should Look like this. Setup in an area outside away from everything. Put on your goggles and respirator. Connect the air gun to your compressor. I used 100psi. Hold the tube in the soda with one hand and the gun in the other. Point the nozzle towards the dirty bits and blast away. Move the tube around to control how much soda is delivered.